The European Tour heads for the Czech Republic this week where Haydn Porteous of South Africa will defend the D+D Real Czech Masters at Albatross Golf Resort. 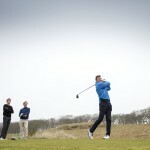 South Africa’s Haydn Porteous is defending champion in the D+D Real Czech Masters at Albatross Golf Resort in Prague. This year’s D+D Real Czech Masters will be the penultimate event in the race for Ryder Cup qualification and there will be a number of players looking to grab European captain Thomas Bjorn’s attention this week. Eddie Pepperell is currently just outside the automatic qualifying spots and a good result this week would do his chances of teeing it up at Le Golf National no harm whatsoever. Also looking for a strong performance will be Belgium’s Thomas Pieters. In 2016 he finished runner-up in this event before securing his place at Hazeltine with a win in the Made in Denmark. This will be the fifth running of this event. It first took place in 2014 when Jamie Donaldson was the winner, securing his spot in the European Ryder Cup team for Gleneagles. After that, Thomas Pieters, Paul Peterson and Haydn Porteous have been champions. Last year, Porteous overcame England’s Lee Slattery to win by two. Designed by Keith Preston, the course at the Albatross Golf Resort opened for play in 2009. It’s a testing tack with seven large lakes acting as protection, together with a selection of well-placed bunkers and 1,200 newly planted trees. The 18th hole has been re-designed for this season. The green has been extended to the lake and now offers several very interesting new pin positions. From both sides, the green is protected by a pair of bunkers, and approach shots that go long will end up in a valley beyond the putting surface. As well as being a simply incredible Scrabble score (if place names were allowed,) Vysoky Ujezd where the Albatross Golf Resort is situated, is a beautiful and historic village in the Beroun district, on the outskirts of the Czech Republic capital of Prague. The first written mention of the village dates to 1310. The weather forecast is mixed. Thursday should see warm and dry conditions but that could break with thunderstorms on Friday. Cooler conditions look set to prevail over the weekend. Not a Sky Sports customer and want to watch the D+D Real Czech Masters? Lee Slattery – The Englishman finished runner-up in this event last year and goes into the tournament on the back of a top-10 finish in the Nordea Masters. Eddie Pepperell – He’s got one eye on the Ryder Cup and needs a strong finish in this event to improve his chances of making the team. He’s been on good form with top-10 finishes in the Scottish Open and The Open Championship. He was tied fifth in this event last year. Thomas Pieters – A former champion and runner-up in this event. If he’s to make Thomas Bjorn’s Ryder Cup team, he needs another win this week. Key hole: 17th. A monster par-4 of 490 yards, this is one that demands a perfect drive and an accurate approach. Water runs down the right side from the tee and then across the fairway just at the limit of driving distance. Even if the players find good position from the tee, they’ll be left with a long iron (maybe even more) to a testing green.